Stitch Fix Box #2 – Not too Shabby! This month’s box wasn’t quite as spot on as my box last month, but I figured that could happen since there are the considerations of fit & price & style all influencing my feelings on the selections every month. Overall, I’m still loving the service though, and I’m so glad to have stumbled across this company! Once again my stylist for the month included a handy little printable with ideas of how to style all of the items in the box, which I really appreciated. The first item I pulled out of the box was a pair of black Freida Corduroy pants (Mavi – $58). I instantly thought EWW, because seriously, cords are back in style?! I tried to give them a shot, but the fit was so horrible on them & they were so unflattering that it wasn’t even a question. They were definitely a return. FWIW, last month the size 10 jeans fit me great (as 10s usually do), but these were inches from closing. Along with those pants I pulled on the fuchsia Colibri Solid Tab Sleeve Blouse (41Hawthorn – $48). I loved the color, but the style wasn’t doing it for me. It wasn’t very flattering, and the fabric wasn’t my favorite. I appreciate trying a style I would never have pulled off a rack to even try on in a store, but this was definitely a no. 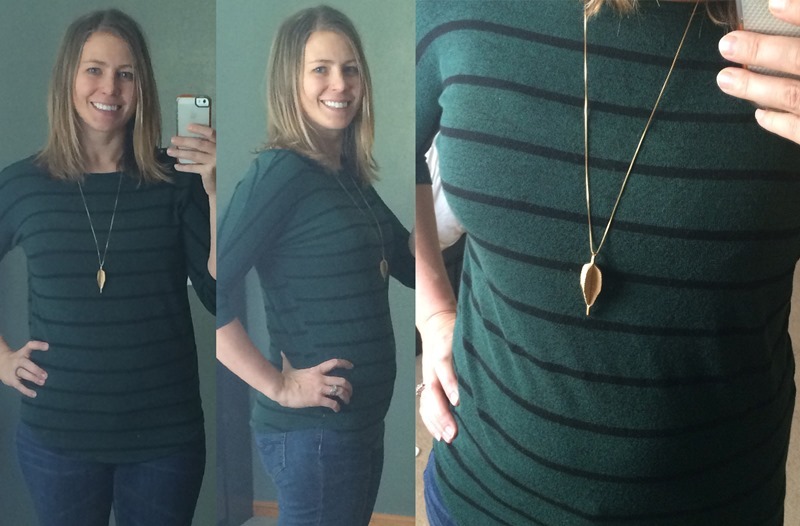 Next I pulled out the green Corinna Striped Dolman top (Market & Spruce – $48). It instantly struck me as something my sis-in-law Jaime would have worn, so I was leaning towards loving it before I even slipped it on. I’ve worn v-neck shirts for so long that it always feels odd to me to wear something different, but especially since I’ve been learning to layer more consistently with scarfs this winter, I really liked it! The cut of this shirt was a nice fit – more boxy than I usually wear, but still fairly slim cut. SOLD! With that shirt I paired the Ramona Arrow Pendant necklace (Bay to Baubles – $28). I’m usually pretty stuck in the mud when it comes to new jewelry, but after decades of only wearing silver, I’ve recently realized that I’m starting to like gold tones as well, so it was fun to expand my horizons a bit with a gold piece. I liked the slim profile and the way it elongated my torso. SOLD! 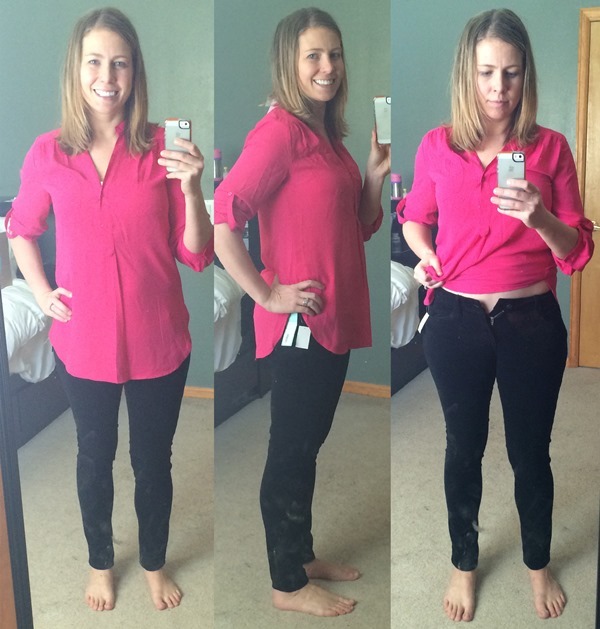 ETA – for those who are asking, the jeans I’m wearing in the pictures below are Chip & Pepper skinny jeans from ThredUP (like new clothing for deep discounts). I got them for $35 (MSRP is $167). Love that site! The last item in my box was an Alan Cowl Neck Asymmetrical Cardigan (Market & Spruce – $58). This didn’t photograph well (for that matter, my camera must have sucked that day, because all of these pictures are pretty horrid! )…but in real life, I actually really liked the fun cut of this shirt. Unfortunately it just bulged a little weirdly in front when I zipped it (probably something losing 10# would fix *grin*), so even though I liked it, I didn’t love it, and back it went. I did like the color though (which surprised me). I’d definitely try something like this again. What the hell was up with my hair and the lighting in this picture? Awful. GAH! This is most definitely not a fashion blog, so I probably won’t post about my box every time I get one, but I just wanted to let you all know that once again I was really impressed with this service. The $20 stylist fee has been totally worth it, and it’s fun to be expanding my sad, dated wardrobe a bit. If you want to sign up and give it a shot, please sign up through this link so I get a credit! Thank you much! 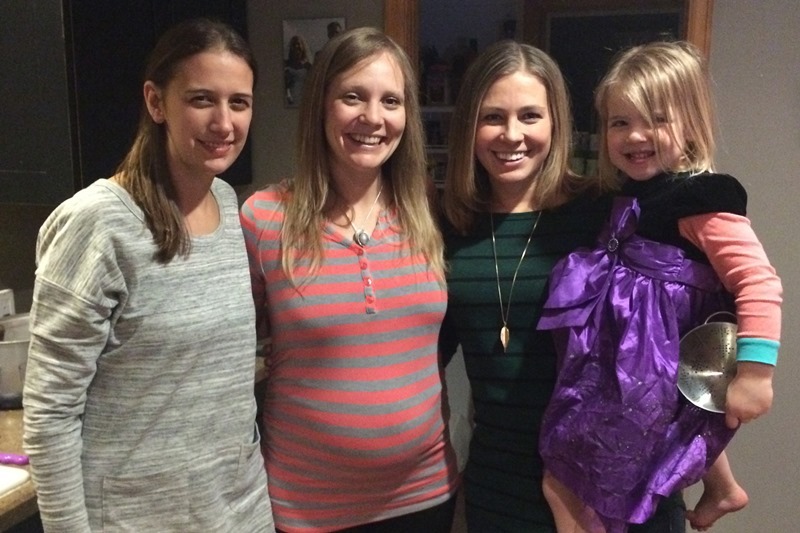 A quick pic before going out last Friday night with my BFFs while wearing my new shirt & necklace (Stella wanted to join the pic – how cute is she?!). I wish they shipped to Canada! Sounds like a fun way to shop when you have kids lol. I hope you continue to post when you get a box. I was all setup last time on stitch fix but just could not bring myself to put a credit card number in. I did today. First shipment is 2/17. Can’t wait. I used your link but nothing seemed to say I was referred. I hope it worked! Yay! I can’t wait to hear about your box! The referral credit happens when your box ships – I’ll let you know if it comes through. Thank you! funny that you didn’t like the pink shirt. i think it’s more flattering (in these pics) that the one you kept! Yeah, standing while sucking my gut in, the pink looked nice. It was the kind of fabric that would show every roll as you bend over or sit though, which I can’t stand. Ohhh I really like that necklace!! So pretty! I love the top you ended up getting too. What a fun service! I hope you continue to post your stuff, too! I am so cheap about clothes, but a few more months of seeing your stuff might convince me to sign up for this. Ha, thanks! We shall see. Also, whatever jeans you are wearing in these shots look great! Chiming in that I like these posts too! 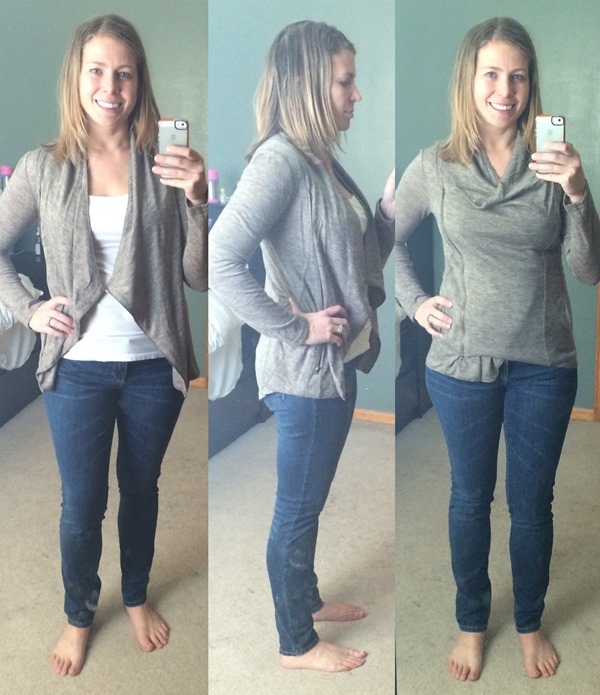 Love that cardigan and its versatility! Cute. I think it looked great on you! I have almost that exact cardigan in a dark gray and lurve it. 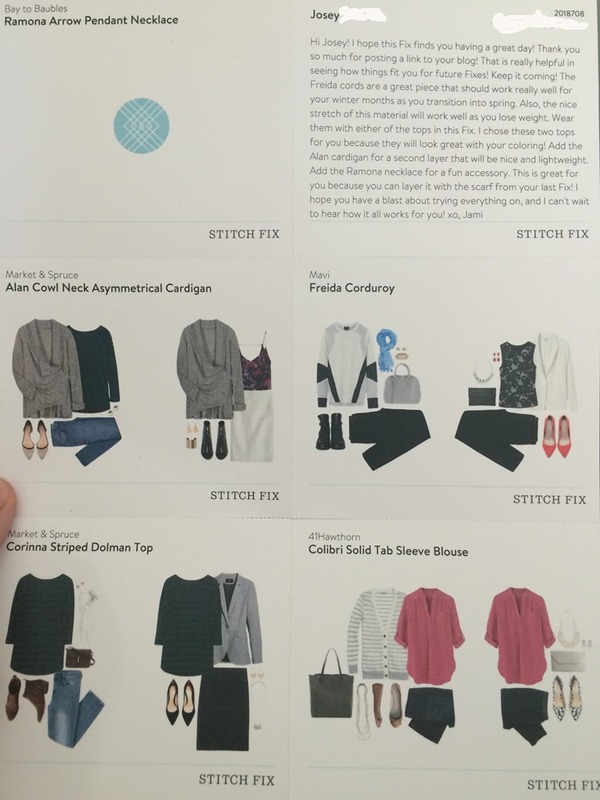 Question – does stitch fix have to be monthly? I think I’d be more willing to do it if it was an every other month thing. You choose the frequency! Every couple of weeks, monthly, every other month, or on demand without a set schedule. I knew you would rock a pair of skinnies. And also as a life long fan of stripes, loving the top. The reference card is fantastic! I love these posts so looking forward to next months box! I also need to look at ThreadUp more. I get their emails but haven’t bought anything through them yet! I’ve been very impressed with ThredUP so far. I’ve mostly bought kids stuff (shoes, swimsuits, etc) but also a skirt, shirt, and pair of jeans for me. Great value for your buck too! I liked everything so much in my first fix that I had to cancel it – just too tempting, and I’ll buy it all. 😦 But I think I’ll do another one in a few months as a reward for making it through this term!! I LOVE that you post about this and I also think the cardi looks pretty fantastic on you! I like purchasing pieces like that because you can pair with skinnies and flats or black camisole/dress pants and heels for two completely different looks. Thanks for sharing! You’re like the millionth person to say this – I guess I should have kept that cardigan! Oops! Next time I’ll post BEFORE I choose what to send back! HA! I love that you do this! I KNOW it isn’t a fashion blog but I totally love it. I love the sweater too!